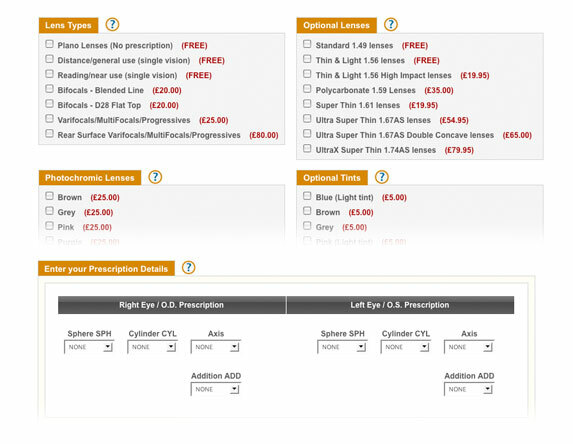 So if you have any comments regarding this development we would really love to from you as it will help us to improve our Prescription and Lens Option pages effectively to meet our customers needs. Please leave any comments below and we’ll put your views forward as part of the development process. I think the step by step process is easier to follow, however would be good to see pricing options listed elsewhere so that you do not need to go through the process to see lense costs. If the was a way to record your prescription within your account then it could be selected during the process effectively removing a step. Also, it would be good if you could track orders within your account, even if it just contains the same information that is sent out in emails. I received my first ever pair of glasses from you last week and I am extremely impressed with your service and your professional attitude to a minor hiccup on the order. Being able to store current prescription in account. Also to take NHS vouchers as more people who eligable for them since losing jobs, etc..
With regards to order tracking, this is something we’re currently working on at the moment as part of a detailed online Customer Accounts system – this will also include functionality to store and re-use prescriptions once our new lens options and prescription system is in place. Having the possibility to track the order’s progress (e.g. Order received, Order being manufactured, Order dispatched…. ), would be fab, once you have placed on order with Selectspecs.com. I like the one page set up. When my sight was affected by cataracts, the biggest bug bear of ordering anything online was the need to keep going through numerous pages in step by step ordering. It’s actually helpful to see on one page how the total cost alters through the options selected and this makes alterations to choices easier. Most people seem to be asking for a tracking of order facility, rather than making the order page idiot proof. Perhaps most of us manage fine with the one page system? I prefer a single page option to a multi step one. However, the single page option would be even better if you could update the price as you add options and have that price be immediately visible (i.e. right next to the options you are selecting,) vs. having to move down to the bottom of the page.